Designing new experiences and business models. Use digital as an opportunity to craft new experiences. Customers seek outcomes and experiences while organizations continue to sell products and services. This gap in expectations only exacerbates in a digital world. In fact, successful digital business models reinforce the brand promise and promote the brand mythology. The shift to a sense and respond model requires a new design point. Mass personalization at scale, big data business models, and augmented humanity provide a starting point to designing a new digital experience. Over the past 18 months, Constellation has helped organizations with digital transformation workshops to set the stage or imagine how digital disruption will impact an organization’s business model. Developing a culture of digital DNA. Success begins at the top. Digital DNA requires strong leaders who are not afraid of dips in share price, cannibalizing existing markets, and identifying new approaches. Organizations must also assess their innate ability to thrive in a digital business environment and nurture digital artisans. These skills go not only beyond the quant jocks who deliver hard science and engineering prowess, but also beyond the creative class who can co innovate and co-create on demand. Consequently, organizations are rethinking the attributes a digital business should employ and embody. Diversity in thinking means more than race or age or digital proficiency. A balance of thought. In an organizations with too many hard sciences, balance out recruiting with philosophers or anthropologists. In an organization with too many thinkers, balance out the model with teams who can execute. Using a framework for digital proficiency and a checklist on digital artisans, organizations can infuse digital DNA throughout the culture. Applying new technologies to existing infrastructure. Digital does not mean wholesale replacement of existing technologies. Digital does not mean just putting a mobile front end or adding a social collaboration feature to a process. The convergence of mobile, social, cloud, analytics (big data), and unified communications provide starting points. Adding sensors to old machinery provides data and context. Mobilizing mainframe data for use in analytics delivers new experiences and provides insight into new opportunities. Bringing external data to internal systems creates new patterns that provide better data for testing out new business models. Use the opportunity to rethink your technology strategy to align with the business objectives of digital transformation. Moving from gut to data driven decisions. Data is the heart of digital transformation. Every touch point, every click, every interaction provides a digital exhaust rich in context. The goal is to move from right time information overload, to real-time contextual relevancy. Organizations need relevancy delivered in real time. From asking the right questions to anticipating future beahvior, the goal is to move from data to decisions. Every bit of data flows into upstream and downstream information aligned with business processes. These information flows then provide the foundation to surface patterns that provide insight. That business insight then enables people to make fact based decisions. Serving up this next best action is the foundation of building data driven decisions. Co-creating and co-innovating with new partners. No company can succeed on their own. In digital transformation, an ecosystem of co-creation and co-innovation awaits. Organizations should participate in industry consortiums and also create their own ecosystems aligned around the organization’s self-interest. In many scenarios, an ecosystem does not exist but market leading and fast follower vendors, suppliers, and customers will join with strong leadership. Translate analog businesses into digital businesses. The effort will require more than adopting the five pillars of digital convergence, but a rethink of the core business model. The new model moves from promoting products and services to keeping promises and meeting outcomes. Manage a world of trust and radical transparency. Success will require more than fluffy statements about open leadership. The power belongs in building relationships in the personal and corporate networks. Leaders must expect business to move from real time to right time. Context by location, time, role, relationship, sentiment and even intent will provide a differentiator. Develop an authentic business brand. An organization must start by asking itself what the company would be like if it were a person. Customers, employees, partners and suppliers expect an organization to live up to a brand promise. That promise requires authenticity in a digital world. Disrupt business models with digital technologies. Keep in mind, technologies will come and go. Disruptive technologies on their own will not address regulatory requirements, optimize costs, drive revenue, differentiate markets or support the brand. The goal is to identify the technologies that will disrupt the business model to allow for transformational change. Work with five generations of digital proficiency. Focus in on how to enable the different generations for digital proficiency. Keep in mind, digital business brings its own culture for how you work, where you work, when you work, what you work on and why you work. These are the key questions in the shift from a people and cultural perspective. While we see many media, entertainment and technology organizations rapidly moving to develop a CDO role, other industries will eventually embrace a central champion who ensures the digital business principles and policies are in concert with an organization’s overall strategy. Today’s CTO’s are also poised to be good CDO’s. In any case, the rise of the chief digital officer is here. Constellation research shows that digitally transofmred organizations differentiate themselves with higher margins, greater market share, increased brand relevancy and massive scale. Join us October 29th to 31st for Constellation’s Connected Enterprise, an immersive innovation summit for senior business leaders using digital technologies to transform their organizations. These leaders convene to discover, share, and inspire each other on how digital business can realize brand promises, transform business models, increase revenues, reduce costs, and improve compliance. The 3-day executive retreat will include mind expanding keynotes from visionaries and futurists, interactive best practices panels, deep 1:1 20 minute interviews with market makers, rapid fire high-energy new technology demos, The Constellation SuperNova Awards event, a golf outing, and an immersive networking event. 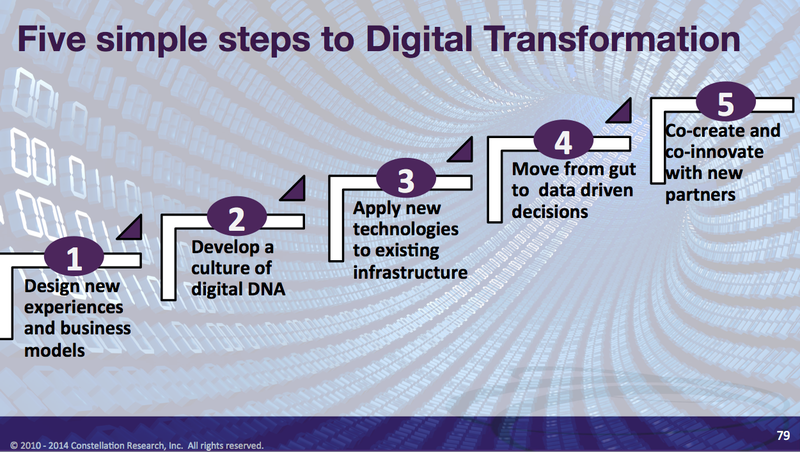 How are you addressing digital transformation? Is your organization ready for digital disruption? Let us know how you are getting there and what first steps have worked. Add your comments to the blog or reach me via email: R (at) ConstellationR (dot) com or R (at) SoftwareInsider (dot) org.